Feathered visitors from Denbigh visit Year 4! This term Year 4 are studying the topic of 'Flight'. Mrs Jones revealed something special - she is a pigeon fancier! She explained to the children that this is a hobby that she has shared with her Dad since she was a little girl. 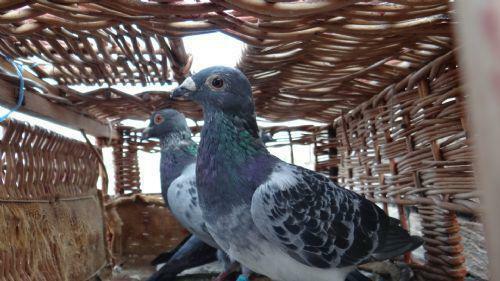 Pigeon fanciers race homing pigeons against the clock and other pigeons. She explained her hobby to the children. The highlight of the afternoon was the opportunity to observe three of her prized birds. The birds were clearly excited to be visiting our school but were keen to get home at the end of the day! We all went out to the school field and kept very quiet as Mrs Jones released the birds from their baskets. The birds orientated themselves and then made their way back home to their Denbigh loft. Mrs Jones' uncle rang her when the birds had arrived home and we were able to work out how long the journey took - an incredible 35 minutes!